Select colours below to see an image of the 6 colour options, or choose custom colours to select your own. This Listing Template theme has been professionally developed by our design team and comes in 6 colours as standard for you to choose from or we can change the colours to suit your branding/choice (choose custom colours when purchasing). This is a great way to display your products in a professional way without the costs of a completely customised design. Ideal for anyone who currently uses a cheap or free template surround. This will give your eBay products the professional look that is so important nowadays on eBay to increase your sales. Updated to be fully compatible with eBay’s 2017 active content requirements. Mobile and Tablet friendly, with the listing template responding to eBay’s 2017 mobile/tablet requirements and fully compatible with eBay mobile and App. Listing template to use to create your products in this theme/design. Dynamic, matching eBay store design. Updates automatically as you add products and update your categories. Dynamic store categories with fly out sub categories. These update automatically as you update your categories in your eBay store settings. Choice of 6 colours OR we can change the colours to match your branding or your preference. Company name ‘logo’ and slogan changed to your business name, or your logo incorporated if you have one. FULL Custom Header – Choice of up to 7 pre-made header banners to choose from (wording can be changed to personalise and reflect your business) OR we can create a custom one for you with images and text to your requirements. Social buttons on left. Can be linked to your social pages or removed if not needed. 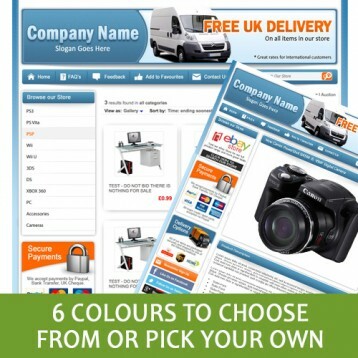 Delivery and Payment banners wording/logos changed as required. As many ‘boxes’ as you need in the main area for description, terms, images, returns information etc. You can easily change the name of each box as needed and the text/content in boxes expands as you type. Extra pages if required (We add a FAQ’s as standard where you might put questions about delivery, payments etc.. but instructions are also provided to create as many pages as you need). 2 Fill out our short questionnaire. 3 Within 1-2 working days we create and send you your listing template. We can customise this theme further if required including additional unique banners, features and even layout. Please contact us with any additional requirements you may have and we can let you know what costs would be involved to make any additional changes not included in this item as standard. Top class customer service. Extra helpful and Really pleased with product. Amazing, exactly what I wanted, they were always there to help, Thank you! Great all round service! They go the extra mile, all done in a day! Excellent product, excellent communication and an excellent service! Thank You. Keep updated with news and special offers. Sign up below. Hi business sellers, In our first Business Seller news of 2019, we’d like to inform you about the following updates. See just how easy it is to list an item on eBay. No HTML or technical knowledge required. © Copyright 2009 - 2017 Designastore.